September is here and the shift in weather has been a welcoming glimpse of what’s to come. The subtle change in the morning air, the smell of wet earth, the finches are a little more chatty, my pace is longing to be slow. I’m seeing pumpkins at the market, Goldenrod blooming and Mums and Dahlias unfurling their tight buds. One last display of dazzling colors before we hunker down for the winter. Thankfully Fall seems to have a good long run here in the Pacific Northwest so we can take our time savoring what will be bestowed in the months to come. Over Labor Day weekend we had an amazing time camping with friends in the Gifford Pinchot National Forrest. I’m looking forward to doing some more hiking there this Fall and hopefully some chanterelle foraging too. This last trip we were lucky enough to stumble upon an endless supply of wild blueberries and huckleberries too, our boys ate so many their lips and teeth were stained a dark purple! The berries made our morning pancakes all the more special and seeing the proud looks on the kids faces from their amazing harvest. The hiking was extraordinarily beautiful, gradual inclines that would lead to a flat plateau with glass like lakes scattered in meadows, the showpiece being Blue Lake nestled in a deep basin. I keep retreating to the memory of our hikes that weekend in the hustle of soccer carpooling or the dull drum of grocery shopping, beautiful imagery to keep in the minds eye. On the topic of camping, coming up with an interesting menu that isn’t too time consuming can be challenging. If there is time during the week to prep a meal I’ll often do that, if not there is alaways Trader Joe’s standbys to help me out. 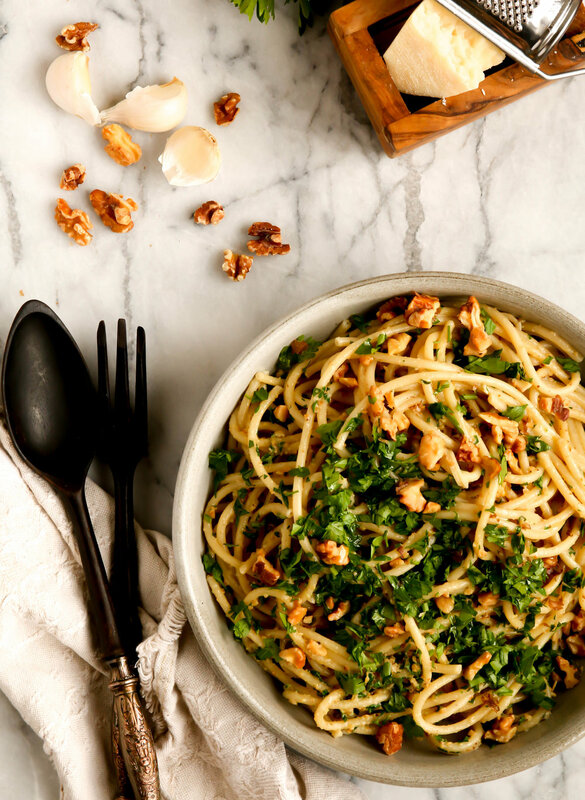 This pasta is a realtivley easy meal, the walnut pesto requires a quick blitz in the food processor but worth the effort and I absolutely love the addition of the chilies, I take out some of the seeds so the heat is tolerable for my kiddos. I have been trying to include several vegetarian dishes weekly to our menu rotation and this one was a big hit with the family. Give it a try, mix in your favorite chilies and let me know how it turns out. Preheat oven to 350 degrees F. Toast walnuts on a rimmed baking sheet, tossing occasionally, until fragrant and slightly darkened, 8-10 minutes. Let cool. Pulse 3/4 cup walnuts in a food processor until very finely chopped but not pasty. Reserve remaining walnuts for serving. Remove the stems from chilies; add to food processor. Plush until finely chopped. Transfer walnut mixture to a medium bowl and stir in garlic, Parmesan, oil, and 1 cup parsley. Season pesto with salt and pepper. Cook pasta in a large pot of boiling salted water, stirring occasionally, until al dente . Drain, reserving 1 cup pasta cooking liquid. Return pasta to pot and add pesto along with 1/2 cup pasta cooking liquid. Toss, adding splashes of cooking liquid as needed, until pesto coats pasta and sauce is glossy.